Patti Fagan, Independent Insurance Agent | Does Medicare Cover Skilled Nursing Care? This is a question I was asked recently, so I thought I’d write a blog about it. 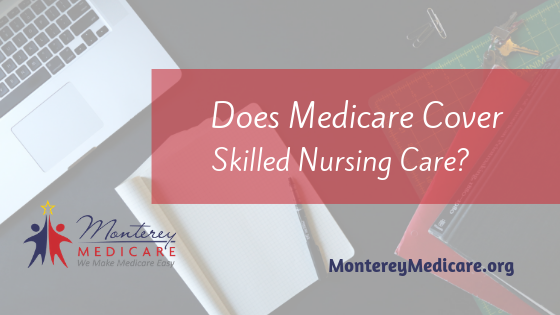 But first, you might want to know what exactly is skilled nursing care? Medicare defines skilled nursing facility care as skilled nursing care and rehabilitation services provided on a daily basis, in a skilled nursing facility. Examples of skilled nursing facility care include physical therapy or intravenous injections, which can only be given by a registered nurse or doctor. The above must all be furnished in a skilled nursing facility after a three-day minimum, medically necessary, inpatient* hospital stay for a related illness or injury. An inpatient hospital stay begins the day the hospital formally admits you as an inpatient based on a doctor’s order and doesn’t include the day you’re discharged. You may get coverage of skilled nursing care or skilled therapy care if it’s necessary to help improve or maintain your current condition. *Please note: According to Medicare, staying overnight in a hospital doesn’t always mean you’re an inpatient. Your doctor must order your hospital admission and the hospital must formally admit you for you to be inpatient. Without the formal inpatient admission, you’re still an outpatient, even if you stay overnight in a regular hospital bed, and/or you’re getting emergency department services, observation services, outpatient surgery, lab tests, or X-rays. To qualify for skilled nursing facility care coverage, your doctor must certify that you need daily skilled care (like intravenous injections or physical therapy) which, as a practical matter, can only be provided in a skilled nursing facility if you’re an inpatient. Medicare will pay for the first twenty days of skilled nursing care. But only after you’ve been in the hospital for three days as an inpatient. (This means you’ll have paid at least the deductible for that three-day stay.) From day twenty-one through day one hundred, Medicare will cover some of the costs of skilled nursing care (meaning you’ll have a copayment). After one hundred days, Medicare will not pay for skilled nursing care (this is considered long term care, and Medicare does not pay for long term care), and you will be responsible for the full cost. The one hundred days are per benefit period. To limit your exposure to skilled nursing care costs, you’ll need additional coverage such as a Medicare Supplement plan (aka Medigap) or a Medicare Advantage Plan. Coverage varies from plan to plan. An experienced Medicare insurance agent can help you compare your options. Please Note: Medicare does not cover long-term care or custodial care (see page 50 of the 2019 Medicare & You Handbook). I hope this helps. If you’re still confused, it’s not you. It’s Medicare. Medicare is confusing. Still have questions? Please feel free to contact me for a complimentary phone consultation.